When I started this digital scrapbooking series last month using purchased scrapbook elements, I really figured I would be finished by now; unfortunately my computer hard drive decided to die and it took a couple of weeks to get it back and running. Well, I was raring to go until I realized I couldn’t find my picture files. I knew I had backed them up, but they were nowhere to be found. As you can see, I did ultimately locate the files and I am very excited to show you more layouts that you can design using someone else’s artistic gifts. This page really only consists of a few elements. The frames are all one piece, the background pink paper, a ribbon and some alpha elements. Each picture I chose had to be reduced in size. This is accomplished by opening the photo and using the Edit>Free Form tool. I sized it according to my preferences and placed each photo beneath the frame layer. I then added the pink bottom (background) layer and left just an inch or two showing from underneath the frame layer. On top of the background layer I placed the multicolored ribbon with a drop shadow and then placed the alpha elements on top. Each layer has a drop shadow to give it a more realistic look. How I decided on this design? 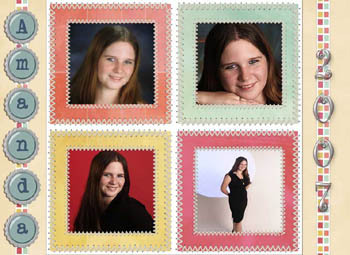 What I wanted was to show case my daughter’s senior pictures from high school. I did not want anything to detract from the photos, so I chose something rather simple, but cute and colorful. With the emphasis on my daughter and not the page elements, her pictures can stand out on their own; but are definitely accented by the design. You want to make sure that your layout doesn’t become too busy. It is a lot like fashion; there is such a thing as too much when it comes to design. Make your photos the focus and you will always come out with a winning page.